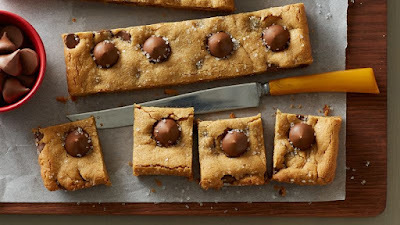 Recipe Source Online: Peanut Butter Blossom Bars - Whatever you do... Don't make these! Peanut Butter Blossom Bars - Whatever you do... Don't make these! 1 Heat oven to 350°F. Spray bottom only of 9-inch square pan with cooking spray. 2 In large bowl, mix cookie mix, oil, water and egg with spoon until stiff dough forms. Stir in Mini Kisses™. Press dough in bottom of pan. Sprinkle 2 teaspoons of the sparkling sugar on top. 3 Bake 18 to 20 minutes or until golden. Immediately top with unwrapped Kisses™ in 4 rows by 4 rows. Sprinkle with remaining 1 teaspoon sparkling sugar. Cool completely on cooling rack, about 1 hour. Cut into 4 rows by 4 rows with one of the Kisses™ in center of each bar. Store in airtight container.